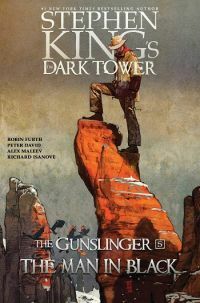 THE DARK TOWER GUNSLINGER 5: MAN IN BLACK. 2019 BEGINNINGS EDITION. Adapted and Written by Robin Furth and Peter David. Signed book plate by Robin Furth included. Hardcover features all issues in this series nos 1 5. OVERVIEW: The exciting final chapter in the Dark Tower: Gunslinger saga is here! Roland continues his journey towards the Dark Tower in his search for the Man in Black - but when young Jake faces peril in the tunnels, will Roland be able to save him? As the Man in Black's treacheries thicken, Roland and Jake must stave off an attack by vicious, cave-dwelling mutants ... little knowing that an even more sinister evil awaits them further inside the cave. As the end of their quest nears, Roland prepares to meet his destiny... but is he ready for it? Can he do what it takes to find the Dark Tower? Even if it means sacrificing young Jake? Don't miss this captivating adaptation of Stephen King's celebrated novel, as Roland finally learns the Man in Black's identity! 2019 Gallery 13 Hard cover. Sealed in a protective book cover.